I am fairly certain that I have the television series upon which this book is based on my Netflix queque, but I had never gotten around to watching it. This is mostly because I am lazy and just don’t watch that much TV, but now I am not sure that I will watch it, because what if it is not as good as the book? 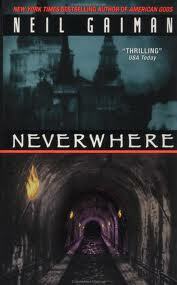 Neverwhere is about an average man who rescues an injured girl he finds on the sidewalk in London; Richard is henpecked by his ambitious fiance, has a an indistinct corporate life with a collection of troll dolls, and is quite taken aback by finding himself saving the girl named Door. The morning after rescuing Door, he is horrified to discover he has basically been erased from his life, and begins a dangerous and exciting quest to get his normal life back. The basic plot elements seems rather cliche, but for some reason it just seems to really work in this book – the magic of Neil Gaiman, I suppose. I am currently reading The Algebraist by Iain M. Banks, which is very dense, with some of the longest sentences I have ever read. I am sure that Banks is doing it to serve the story, and it is certainly well written, but it certainly highlights the economy of Gaiman’s prose. Neverwhere, despite being located in some unfamiliar locales, does not get bogged down in detailed descriptions of place or appearance. Perhaps this is a result of being based on an originally visual presentation of the story, but it seems to me that Gaiman is able to evoke mood and atmosphere without enormous amounts of extraneous text. Gaiman’s The Graveyard Book is perhaps a better example for this, but Neverwhere seems to fit in as well. The story moves along briskly, the characters are fun, and it feels like there are more stories to be told about London Below. I have already read both the novel and watched the television series, so was unsure about the necessity of reading the graphic novel adaptation. However, it is a really interesting book, not the least of which is Martin’s and Abraham’s description of their struggle with actually adapting the story to this format. Martin’s novels are really dense, so I would imagine that Abraham found adapting the story to this format quite a challenge. I thought it was done well, streamlining the story without adding in superflous characters to bridge the gap (*cough* Roz *cough*), as seen in the HBO series. In terms of story, the graphic novel does not really offer anything new, but it is a nice summary of the plot. I was indifferent to the art, on the whole. I thought the Tyrion character was really well drawn in the graphic novel, as ugly as he is described being in the book – Peter Dinklage is perfection in the television series of course, but he is a handsome man playing a character who is most definitely not. The female characters are all drawn very similarly but for hair and height, and are really just generic female comic book characters in common poses. The graphic novel also shows Westeros as very clean, bright and shiny, for the most part, which it certainly should not be. Nothing about this graphic novel really stands out for me, probably because I am already so familiar with the storyline. I am not sure why this was published – a challenge, something the public really wanted, or just an effort to capitalize on the current popularity of the novels? Unless something remarkable happens with the next, I will not be continuing with the series. Wicked: The Life and Times of the Wicked Witch of the West was not really the story I was expecting when I first picked up the book this summer. It tells the life story of Elphaba, best known as the Wicked Witch of the West from Frank L. Baum’s Oz series, but it deals only briefly with the events in the movie and from an entirely different perspective. For some reason, I assumed it was going to be rather funny and fantastical, but in fact it is quite dark. 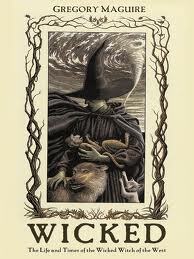 The story begins as Elphaba’s mother is pregnant, a noblewoman married to an unpopular preacher in an isolated area. Her daughter is born green, with sharp teeth and an enormous aversion to water. Her father thinks she is born green as a punishment of the Unnamed God, whereas her mother and Nanny suspect she might be the result of a intoxicated tryst with a green man. Given her strange appearance and apparent vicious nature, Elphaba has difficulty bonding with the people in her life, and this sense of isolation and independence is likely Elphaba’s most distinguishing characteristic. The remainder of the novel follows Elphaba as she grows into adulthood, the events of her life set against larger political landscape. The politics of Oz are explained in great detail, and they have been complicated for a long time. There is a political movement to exclude talking Animals from everyday life, there is government sponsored genocide and conspiracies, and there is family drama that reflects the larger issues behind this. Throughout it all, Elphaba tries to do the right thing, with gestures big and small, although the results are unpredictable and disaster often occurs. This is made evident in how Elphaba reacts to the arrival of Dorothy in Oz – the perspective of Wicked on this familiar story show that the Wicked Witch and Dorothy share much more in common that one might think. I found some parts of this book really kind of boring and drawn out, but generally enjoyed how much intelligent interaction there is amongst the female characters. Although they all have their own agendas, their relationships are complicated and interesting and taken seriously by Maguire. It is an interesting book, but it isn’t actually very much fun to read. I know that Maguire has written a series of books stemming from this one, but I am uncertain if I am going to pick them up as well. As much as I did not love Grossman’s The Magicians, the ending of that novel left me feeling pretty hopeful for the sequel. The last scene, indicating that the characters would be moving into a more clearly defined quest in an magical world, was pretty promising. 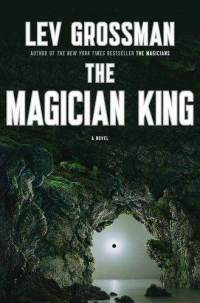 I think that The Magician King is quite a bit more fun than the first book, and Quentin seems to be less annoying than in the first book, which is a good start. The second novel in the series starts in Fillory, where Quentin and his three friends are ruling in an obvious parallel to the Narnia books. There are differences between the two – family relationships, magical abilities, age, etc, but it is still two females and two males from Earth ruling this magical realm. In the Narnia series, the Penvensie children rule Narnia seriously, and undertake quests for practical purposes or for fun. In The Magician King, Quentin searches out an adventure or quest because he is bored, which is an irritating holdover from the first novel. Quentin still wants to live his life like something from a fairytale despite actually living in the setting of a fantasy novel; his friends and companions seem to tolerate this, but it is still hard to like him as a person for the most part. However, the action moves pretty quickly, and varies between the quest and Julia’s backstory from the previous years. Julia is fundamentally changed from the person that was first introduced in the opening scenes of the first novel. Her story is much darker and related in more detail than that of the other characters, and her obsession and awkwardness reminded me slightly of Lisbeth Salander. She accompanies Quentin on the quest, which Grossman carefully imbues with a flashes of danger interspersed with hard work and boredom, much like he had already depicted magical education. Although I actually finished this novel months ago, when I think about the plot now it seems to me that the series is about about choices and unexpected consequences and change. The most beautiful scene in the first novel was the students transformation into geese, and Alice’s sacrifice, Julia’s desperation, Penny’s mysterious reappearance, and Quentin’s choice at the end of The Magician King are all variations on that theme. This, along with Grossman’s ability to end the stories on interesting cliffhangers, make this book a flow well from the first as well as setting up a third novel. Having just finished A Dance with Dragons, I was pleased and a bit surprised to see a George R.R. Martin paperback in the book stand at the grocery checkout this spring. I bought it, in a fit of heady impulse purchasing pique, and… found it was not very much like the A Song of Ice and Fire series at all. Fevre Dream was written in 1982, and is a vampire novel set in the pre-Civil War Southern United States. It is largely set on the Mississippi River, and centers on the steamboat trade along the river. Captain Abner Marsh is an excellent captain, but has largely lost his fleet of steamboats through bad luck, and so is at a loss both financially and in terms of his reputation. He meets Joshua York, a rich gentleman who only comes out at night, who promises to make Marsh’s dreams come true, as long as he doesn’t ask any questions of York. Of course, Marsh is no fool and knows it is too good to be true, but is willing to make the deal to get what he really wants. 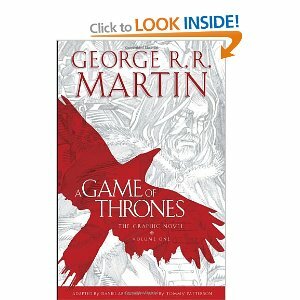 Here, Martin seems to introduce the ideas around trust and power that are later fleshed out in A Song of Ice and Fire. I haven’t even read that cursed Twilight series, and yet it continues to push itself into my cultural consciousness, ruining affecting how I read other, better books. When I was reading Fevre Dream, I could not help but think about how Stephanie Meyer’s vampires with a conscience had predecessors. Vampire York feels guilty about how vampires treat humans as though they were farm animals; through scientific experimentation, he found a way to live without feeding on humans. Better living through chemistry! Other parallels include battles between vampire groups with differing moralities, vampire reproduction, and hiding in plain sight. I can only vaguely compare the two, but think that Martin’s characterizations are not as cliche as are Meyer’s and he seems to give a bit of an explanation for a non-traditional way reproducing vampires, although it still did make me roll my eyes a little as I read it. Truthfully, his version of vampires are a little different from the traditional altogether, some parts of which worked better than others for me. 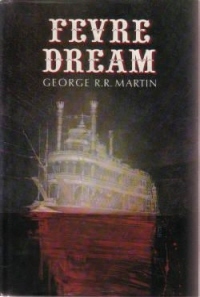 While the dialogue didn’t feel quite as polished as it does in later Martin, the book has the same attention to setting and mood as does Game of Thrones. The description of the river boats and the travels along the Mississippi are nicely detailed, and he describes the politics and culture of the time in an almost off-hand manner, keeping the focus on the story itself. Martin’s willingness to kill off his characters seems to have been an early trait of his as well, which is kind of reassuring in a horror/fantasy novel. Although it was nominated for a few awards when it was first published in 1982, I did not really love it as I do other Martin works.